You don’t have to travel around the world or live on the road for months on end to call yourself a bicycle traveler. 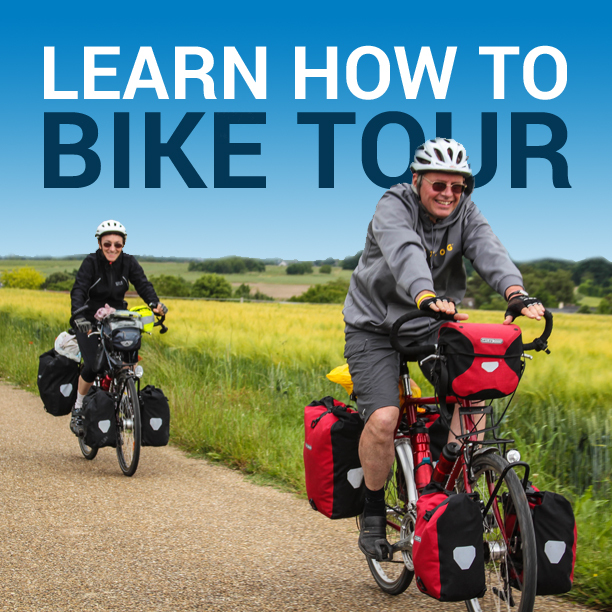 Conducting short trips by bike in your local area (or even in your home country) is a great way to get out and experience the joys of bicycle travel. Yesterday I flew from my home in Park City, Utah (USA) to Kansas City, Missouri. Now that I’m in the great state of Missouri, the plan over the next 10 days is for my friend Josh and I to ride our bikes across the state on the famous Katy Trail. I’ll be sure to share photos, video and stories from the trip in a future article, but for now, here is the packing list for my 11-day trip to Missouri. Hopefully this article will help you in preparing your packing lists for shorter trips by bike. You should note that 1) I only brought a rear rack and two panniers with me because I don’t plan to use front panniers on this particular trip. I won’t need them because I am carrying less clothes and gear than I would typically carry on a longer trip by bike. 2) I am also carrying a whole lot more camera gear than your typical bicycle traveler might carry. I have all this camera gear because I plan to bring you back a ton of great photos from my travels… and I’ll be working while I’m out on the road. So, this gear is necessary for me to continue running this website. This entry was posted in Bicycle Touring Pro Articles, Bicycles, Clothing, Cooking, Electronics, Featured How-To Articles, Locations, Main Articles, Missouri, North America, Panniers, Planning, Products, Sleeping Bags, Tech, Tents, United States and tagged arkel panniers, axiom panniers, bike across the state, bike friday, folding bicycle, how to pack for a bike tour, katy trail, local bike tours, minimalistic, missouri, packing list, planet bike, short bike trip. Hi! I’ve really enjoyed reading your blog the last few months and this morning was super surprised to see you’re coming to Missouri! I live in St. Louis but my adventure racing team uses the Katy trail a lot to train. I have only been as far west as Augusta, but I’ve really liked what I’ve seen. Hope you have a great trip! Let me know if you need anything once you get to St. Louis. Looking forward to those great pictures! Awesome that you’re doing the Katy! I’ve done it a few times and live a mile from the trailhead in Saint Charles. I am looking forward to your updates on the Katy. I plan to start the Katy on the 29th from St. Charles and I want to know how badly washed out the trail is and how you coped with the conditions on your Bike Friday. I see the latest trail conditions state possible mudslides and a possible trail closing from Hartsburg to Mcbane if the river reaches predicted levels. Good luck and fill us in ASAP. Darren…I met you in Sedalia as you began your KATY ride. I was with Adventure Cycling, to begin in St. Charles. How was your trip? We aborted on Thursday, due to impending tornado and violent storms in Sedalia…safety for our participants is crucial. Arrived home to find my biking buddy had put together a new ride…world tourist by Friday…I’ve sent him to your site. 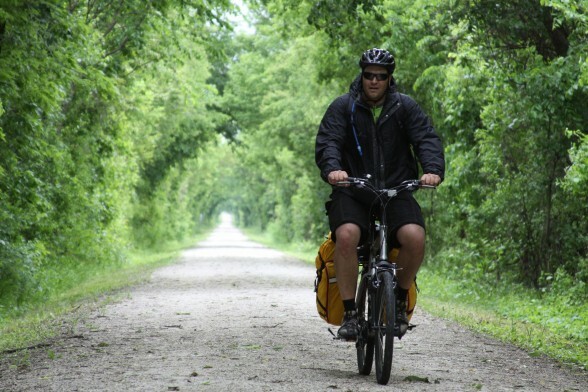 I’m somewhat familiar with the Katy Trail but have never actually ridden it. Next summer I plan on taking a cross country tour (SF to DC) and hope to incorporate the Katy Trail into the tour while crossing Missouri. As I understand it, the Katy is not paved but is fairly compact and hard. My question: will a loaded tourning bike with 700 x 32 tires have any trouble negotiating the length of the Katy? Jerry, as long as the trail isn’t wet and muddy like it was when I was there, your touring bike tires will be great for the Katy trail.